If you are a fan of those GPT or commonly known as “get paid to” sites where you will earn rewards, points, gift cards and cash just to do various micro tasks from home, InstaGC is the one of the best ones that you can try and I will explain why you should be using this site for extra cash and how it works. Why I use and recommend InstaGC? I love InstaGC because it is open in several countries all over the world including those who live in the United States. You can use this site if you are at least 13 years of age with your parent’s content, so it is a very easy way for teens to make money online. All InstaGC members can access the site 24 hours a day 7 days a week and choose exactly which tasks you want to work on and for how long. It almost doesn’t seem like work because the tasks are really enjoyable and probably something that you have already done or currently do while you are online. Here are a few ways that members can earn with InstaGC. Once you sign up for the site, you will be awarded with 20 free points just for signing up for InstaGC. When you log into your account, you will see your points displayed in the upper right hand corner of your screen. You will definitely want to read all the guides and take a tour of InstaGC so that you will know exactly how you earn cash on this site as well as some helpful tips to increase your earnings. Most people start with an offer wall to select the ones that make sense for them. Make sure you find the best ways to earn points when you are looking for them. Make sure that you browse through the offer walls because they are updated and changed to reflect new offers on a regular basis. InstaGC is one of the few companies encourages and recommends their members to use multiple email address because some offers require you to confirm your email address. You will need to complete this step in order to get credit. How much can I make with InstaGC? It is realistic for people to earn $100 dollars a month on this site alone. InstaGC is a site that allows you to make money in the form of gift cards in many different ways. Your potential in earning gift cards is limitless and many people have cashed out for huge amounts on InstaGC. Here is a breakdown of how much the points are worth. Once you have the minimum number of points you can exchange your points on InstaGC for a variety of gift certificates to great retailers like Amazon.com, Starbucks and others. In fact, you only need to have 100 points in your account in order to request a gift card but before you can do so, you will need to verify your account via a one time phone verification. 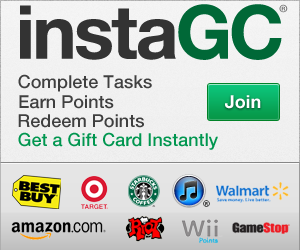 InstaGC has over 290+ gift card options for you to choose from. If you prefer to get cash, InstaGC has 3 options for you. You can either request a check, link to your bank account to get your money directly deposited there or send the funds straight to your PayPal account. You have more chances to earn more points when you use and access InstaGC from your mobile device because they have other earning opportunities. You can also refer your friends and earn 10% of what they earn. One easy way to refer others is to start your own blog which you can do for free. I recommend using Blogger or even Weebly for a basic, easy blog that you can set up in just a few minutes. How to Sign up for InstaGC? Go to InstaGC’s officail website here to get started making easy money and instant gift cards online. Any sites similar to InstaGC? Yes there are some get paid to sites that are similar to InstaGC that you can try below. Have several more listed on the Get Paid Online page of Workersonboard.com here. If you need more international get paid to sites, please go to WorkersonboardTalk here and read about some of the companies that others are using to make easy or instant cash from home. Sites where you can earn $10 a day and accepts international members found on Workersonboard Talk. You can also watch this video tutorial for even more tips and a visual of how InstaGC works. Don’t forget to subscribe to my YouTube channel for more get paid video tutorials.